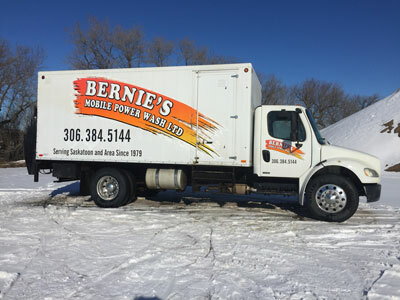 Bernie’s Mobile Power Wash Ltd. is family owned and operated, producing quality results time and time again since we bought our existing and long time running business in 1979. Our mobile power washing services are available for areas in rural Saskatoon such as Regina, Moose Jaw, Humboldt, Prince Albert, and North Battleford. This reach has allowed our customer base to triple in just 2 years. Our employee team and fleet of equipment has also grown, from 2 trucks and 1 employee to 4 trucks, 2 full time employees, and 2 part time employees. We work with well-known suppliers in the industry to provide the products and services that are proven to provide produce quality results. These include Paige Industries, a local dealer of cleaning products and Clark’s Supply, a local dealer of quality parts for replacement and repair. The friendly, knowledgeable team at Bernie’s Mobile Power Wash uses cleaning products that are tested and proven to yield quality power washing results. We always carry out our business operations with a positive, friendly attitude, clarifying customer’s requests so that everyone involved is happy with the end product. We guarantee the best job possible, completed safely and efficiently. The power washing we provide is suitable for interiors and exteriors of residential or commercial buildings, construction sites, oil industry equipment, and so much more. Our cleaning process for eliminating graffiti is fast and effective; it leaves zero to very minimal shadowing on most surfaces. For pressure washing needs of all sizes, Bernie’s Mobile Power Wash Ltd. can get the job done.